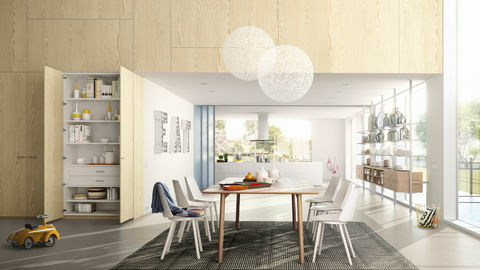 raumplus sliding doors make space. They can be used to create open-plan interiors without having to lose the protection and discretion offered by enclosed areas. Used as room dividers, our doors can temporarily section off any zone – from kitchens an bathrooms through guest and conference areas – when you need to shut out eyes, noises, or odors. And when you’re done, the “temporary wall” can be removed in an instant, restoring your open-plan interior’s generous spaces.